Turkmenistan is located in Central Asia, bordering the Caspian Sea, between Iran and Kazakhstan, comprising of 488,100 sq km. It has a population of 4,952,081 (2005). 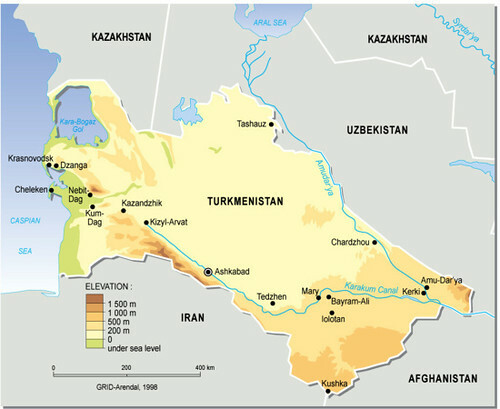 Major environmental concerns are: contamination of soil and groundwater with agricultural chemicals, pesticides; salination, water-logging of soil due to poor irrigation methods; Caspian Sea pollution; diversion of a large share of the flow of the Amu Darya into irrigation contributes to that river's inability to replenish the Aral Sea; desertification.